Installing demo version is easy as never before, you can install any demo with just one click with Boombox Demo Importer. Before installing demo please consider following: If you want your demo to looked like selected demo and to prevent conflicts with current content, we highly recommend importing demo data on a clean installation. Please note that content of live demo version such as media files, posts and pages will be different from content in installable demo files. We decreased posts count and changed some settings to keep the theme lightweight and to make the demo load faster. Here is how one click demo works – It took XML file with content, DAT file for Customizer and WIE file for widgets and set all them together with one session. 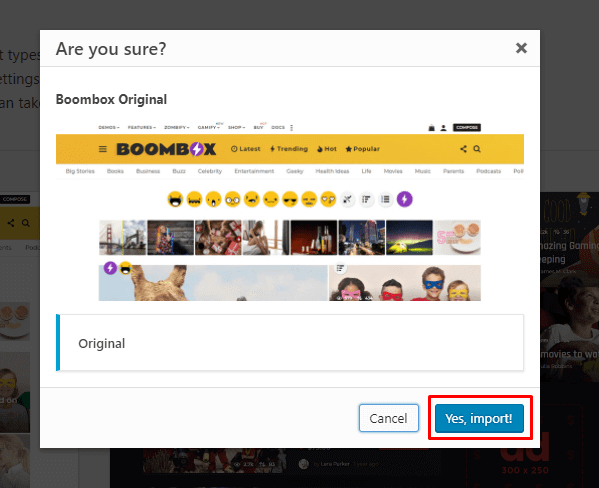 Once you installed the theme and activated required and recommended plugins, go to Dashboard ▸ Appearance ▸ Boombox Demo Import and click on it. You will see page where you will be able to choose any of predefined demos. Select the Demo which you decided to import and then click on Import button. In the latest version of Boombox you may find 16 demo versions and we are working to add new demo periodically.